How to Fix Windows Media Player Won't Play AVI files Problem with the Best Solution? How to Solve Windows Media Player Won't Play AVI files Problem? Albeit Windows Media Player claims to support AVI file format, sometimes we still find it go wrong when it comes to play AVI files. In such case, we can't help asking why, why Windows Media Player won't play AVI? And how to tackle this tough problem? Now no need to worry! This article will guide you to solve AVI won't play on windows Media Player problem and aid you to play AVI files on WMP with no amount of road blocks. >>> HOT search: QuickTime won't play avi. 5KPlayer - Freely play AVI files on Mac (10.11)/Windows (10) to avoid Windows Media Player won't play AVI issue! No need to install any codec packs, plug-ins or components. Why Windows Media Player Won't Play AVI Files?? Major Reason: for the most part, Windows Media Player failing to play AVI files lies in the AVI video codec problem. If the AVI files was encoded with non-Microsoft codec or an AVI compressor/decompressor that your computer lacks. So that's the main reason why Windows Media Player Can’t Play AVI problem occurs. Minor Reason: Besides the above-mentioned reason, sometimes this condition happens due to AVI files being corrupted or damaged by accident. You see, perhaps AVI file is interrupted and then goes wrong during its downloading procedure or there appears some transfer error when transferring AVI files to other devices or something. Here introduces top four solutions to fix AVI files not playing in Windows Media Player issue with a desire to assist you to tackle this problem with the greatest of ease. Solution 1: Convert AVI files to Windows Media Player most commonly used video format like avi to mp4, wmv, mpeg etc. Solution 2: Install the missing codec that Windows Media Player needs to play AVI files. Solution 3: Resort to the Windows Media Player Alternative like 5KPlayer or VLC for playing AVI files. 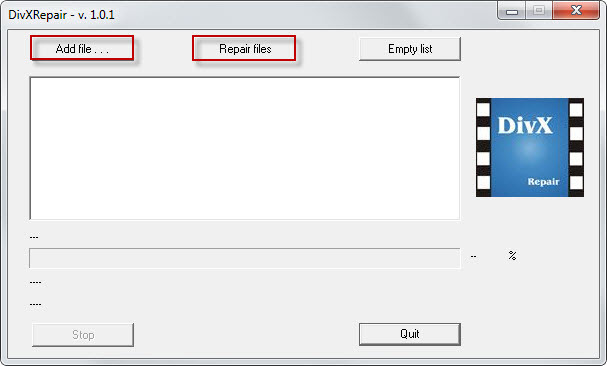 Solution 4: Apply the solid AVI file repairing software to repair the corrupted AVI files. Since Windows Media Player is developed by Microsoft, it's advisable for you to convert AVI files to Microsoft's WMV and ASF (in general, there is no problem about WMV and ASF playing on WMP.). In this way, you would be far away from the WMP won’t play AVI trouble. Certainly, you can't make this come true without the aid of the best video converter - MacX Video Converter Pro, which can help you convert AVI to WMV, ASF, MPEG and more WMP compatible formats without any significant quality loss. Not only Mac users can benefit from this awesome video converter, but also the Windows users. The specially Windows designed version - MacX HD Video Converter Pro for Windows solves all affairs to convert AVI files to Windows media formats like what it did on Mac. 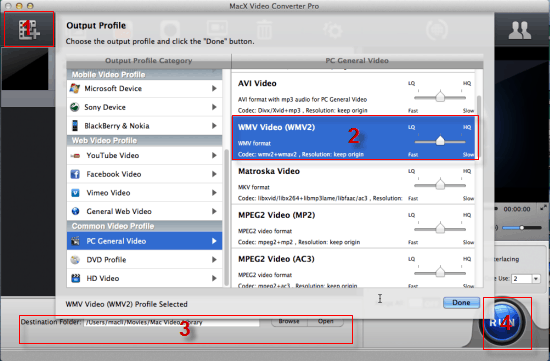 Free download the AVI to WMV video converter for Mac or Windows version and launch it. Click "Add File" button to import AVI files you want to convert. Choose "to WMV" as output format from format list. The optimized default settings ensure the best output quality. Lightly click "RUN" to convert AVI to WMV with a split second. Tips: Currently only the Windows Media Player 12 supports to play MP4, M4V, MOV, 3GP, M2TS video files. If you are using the former version of WMP and also want to play the former mentioned video formats, this all-round video converter pro can address your needs to convert these video to WMV, ASF, and AVI video to MPEG Windows Media Player friendly formats with unaffected quality in solely mins. It's well-known that usually the AVI video file is encoded with DivX or XviD codecs. Thus, in a bit to play AVI video file well with WMP, you need to install DivX or XviD codecs at the first place. You can download and install the DivX codecs at videohelp site and get XviD codecs at koepi site. Then restart your computer and you can then play AVI files on Windows Media Player with smoothness. Assuming that you are not versed in dealing with Windows Media Player won't play AVI problem by installing the abstract codecs or converting AVI files, it doesn't matter! You still have another option-turn to Windows Media Player alternatives for assistance. Among them, VLC and KMplayer and 5KPlayer are the most preemiment AVI video players. Both VLC and KMplayer work seamlessly with AVI files, as well as MP4, MOV, MKV, 3GP, FLV,etc. More importantly, VLC media player also delivers perfect performance in playing incomplete or corrupted AVI files so that you can play the damaged AVI files without worry about any unplayable issue. And KMPlayer outshines WMP related to its rare 3D format playback function, which allows you to experience the amazing 3D home cinema world with a low CPU Memory share and an optimized, stable playback supported by GPU. Be fed up with Windows Media Player AVI playback problem? Then go and have a try on VLC or KMPlayer. In the event that your AVI files not playing on WMP rests with the AVI files corrupted or damaged. You can mend AVI files like what you do on corrupted MP4 files repairing. Then here gives you the remedy-download and install the highly sought-after free DivXRepair, which has the knack to repair all kind of avi files through removing the bad parts and re-asseming the avi file. Step 1: After free Downloading and install this software, open it and select the corrupted AVI files by pressing "Add File" button. Step 2: Click "Repair Files" button to initiate the AVI file repair process. Step 3: After repairing finishing, preview the repaired AVI video file before saving. Step 4: Save your repaired AVI file to your desired destination folder. Note: Apart from aiding you to effectively fix the WMP won't play AVI problem, this all-in-one video converter program makes you wow at its superiority in converting any video no matter the SD or HD video from camcorder or online website. You can take advantage of it to convert AVCHD to MP4, AVI to MOV, MKV to FLV, MTS to 3GP, etc. so that you are free to play back any video on your latest iPhone, iPad, Samsung, Sony, HTC, Microsoft devices with 1:1 high quality reserved. MacX Video Converter Pro is a feature-rich, high quality, and incredibly fast avi to iTunes video converter. It's an all-in-one video converting solution with top quality, easiness, fast speed and high-efficiency.